← May’s Health Topic: Stress and Stress Reduction Tips in the AIM Monthly Newsletter! Acupuncture and Chinese medicine constitutes a whole medicine, but can often be difficult to understand due to language (qi, blood, yin, yang, zang-fu, meridians, etc). There are more similarities between Eastern and Western medicine than you may think. Continue reading for a correlation between cortisol and “Liver qi stagnation” and the pathologies stress can create. Stress triggers the hypothalamic-pituitary-adrenal axis (HPA axis), a complex neuro-endocrine system in the body, which in the end, stimulates the adrenal cortex to produce cortisol, a stress hormone. Vitamin B6 is a water-soluble vitamin, in that the body cannot store it. Three examples of B6 functions are: 1. Making hemoglobin (the oxygen carrying protein of red blood cells), 2. Maintaining normal nerve function, and 3. Properly absorbing magnesium for tear production. Chronic stress leads to chronic high levels of cortisol. This can deplete vitamin B6 (just one example). Deficiency of B6 can lead to an anemia similar to iron-deficiency anemia, poor cognitive function, depression, neuropathy, visual problems, and dry eyes. These three examples of B6 functions above are related to the Chinese medicine concepts of Liver blood and Liver yin. Blood and yin are nourishing by nature. Furthermore, the Liver “opens to the eyes,” allowing the blood to nourish the eyes, and “dominates the tendons,” ensuring adequate flow and nutrients to the extremities. In Traditional Chinese Medicine, stress causes the Liver qi to stagnate. Chronic Liver qi stagnation can deplete the Liver blood and yin. Liver blood and yin deficiency lead to dry eyes, blurry vision, limited flexibility, numbness or spasms in extremities. General blood deficient signs and symptoms include pale complexion, pale conjunctiva, pale nails, dry skin, insomnia, and fatigue. Foods that nourish the blood are foods that are high in protein. These include various fish and meats, beans and seeds. Foods that nourish the yin are usually fatty or high in moisture. Asparagus, avocado, and bananas are some of the best vegetables for yin. These examples are all good sources of vitamin B6. It is best to simultaneously nourish the Liver blood (supplement Vitamin B6) and soothe the Liver qi to prevent further depletion of the blood. Soothing Liver qi means to reduce chronic stress and encourage homeostasis (in this case, of the natural rhythm of cortisol). The amount of cortisol in the blood undergoes a diurnal variation. In people with normal levels, cortisol should peak around 8am and should gradually decrease and be lowest around midnight to 4am. In people with Cushing’s syndrome or with chronic fatigue, cortisol levels can be flattened or lowest in the morning and highest at night. This also correlates with Chinese Medicine’s concept on yin and yang. 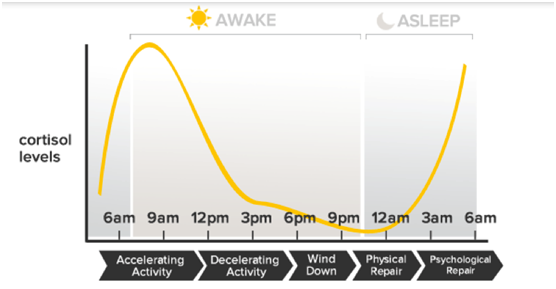 The yang is highest during the first half of the day. 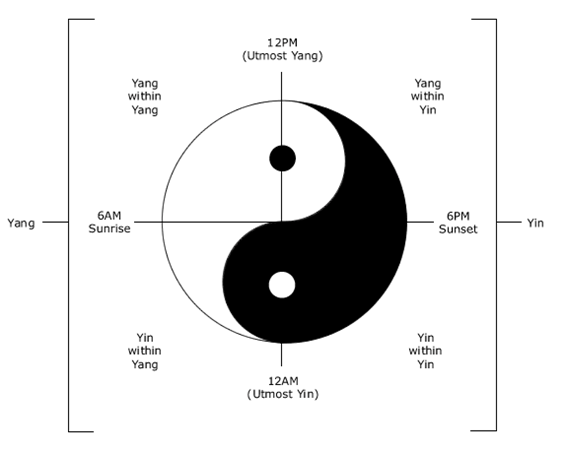 As the day progresses the yang declines and the yin increases and is what grounds us at night to sleep. If a person has stress due to Liver qi stagnation, not only do they have a relative excess of yang, but also they will often wake during the “Liver time,” between 1 and 3am. So depending on the person, and the time of day, the cortisol level may need to rise or lower. Acupuncture has been studied with numerous chemicals and hormones, and has been shown countless times that it has a strong regulatory or modulating effect. Acupuncture can help the body find it’s homeostasis. Scott, Elizabeth. “Cortisol and Stress: How to Stay Healthy.” About.com. Medical Review Board, 22 Sept. 2011. Web. 4 Mar. 2012. <http://stress.about.com/od/stresshealth/a/cortisol.htm>. “Vitamin B6: MedlinePlus Medical Encyclopedia.” MedlinePlus. U.S. National Library of Medicine, 28 Feb. 2012. Web. 04 Mar. 2012. <http://www.nlm.nih.gov/medlineplus/ency/article/002402.htm>. “WHFoods: The World’s Healthiest Foods.” The World’s Healthiest Foods.The George Mateljan Foundation, 2012. Web. 04 Mar. 2012. <http://www.whfoods.com/whoweare.php>. This entry was posted in Chinese Medicine (TCM), Stress and tagged acupuncture, Acupuncture Duvall, Acupuncture Redmond, Acupuncture Redmond Ridge, AIM for health!, AIM4Health, Alpine Integrated Medicine, Bastyr, Best Doctors in Redmond, best massage in Redmond, Brooke Azie-Rentz, Business Plan, Carnation ND, Chanda Zeigler, Chinese medicine, Debbie Yu, Deep Thoughts, Doctor, Doctor Redmond, Doctor Redmond Ridge, Dr. Brooke Azie-Rentz, Dr. Liat Engel, Dr. Mohammad Shegeft, Dr. Rhea Abbott, Duvall, Duvall Doctor, Duvall Naturopath, Duvall ND, Duvall Wellness, Erin Alberda, Health and Wellness, Hot Stone Massage, Immunity, massage therapy, Natural Health, Natural Medicine, ND, physical therapy, Primary Care Redmond, Redmond, Redmond Doctor, Redmond Health, Redmond Massage Therapy, Redmond Naturopath, Redmond ND, Redmond Primary Care, Redmond Ridge, Redmond Ridge Doctor, Redmond Ridge Health and Wellness, Redmond Ridge Massage, Redmond Ridge ND, Redmond Wellness, Rehab Exercise, Rehabilitation Exercise, stress, stress relief, Stress Treatments, Vision. Bookmark the permalink.